In our last blog post we emphasised how important it was for runners not to neglect their gym work and looked at a few upper body exercises to strengthen and maintain/improve posture when running. We have put in front squats because, as well as working the thighs and glutes they also help to increase lower back strength, which is an important area for runners. As you will see in the video we work the quads (front of thigh) alternately on the lowering phase as this really helps to strengthen the muscles above the knee individually for a bit of extra protection when running. The calf raises are also performed individually to allow each leg to work to it’s maximum, unilaterally. Remember that each time your foot strikes the floor something around 3-6 times your body weight goes through your body so it is really important that you don’t neglect your gym work and especially the lower body. Aim to perform this routine twice a week, increasing the weights by approx 10% each week. Lying Leg Curls work the hamstrings (back of the thigh) and again we work the legs individually on the lowering phase to increase strength in the muscles for running. As before, aim to perform these exercises twice a week, increasing the weights you use by approx 10% each week. 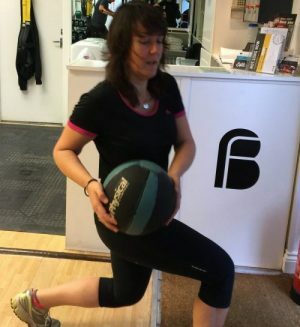 These are just a few exercises that help to strengthen the lower body; for other ideas and workouts please get in touch and we would be more than happy to give you some other ideas and routines.